Once you are in the habit of making videos, you will be able to crank them out in less than a minute. 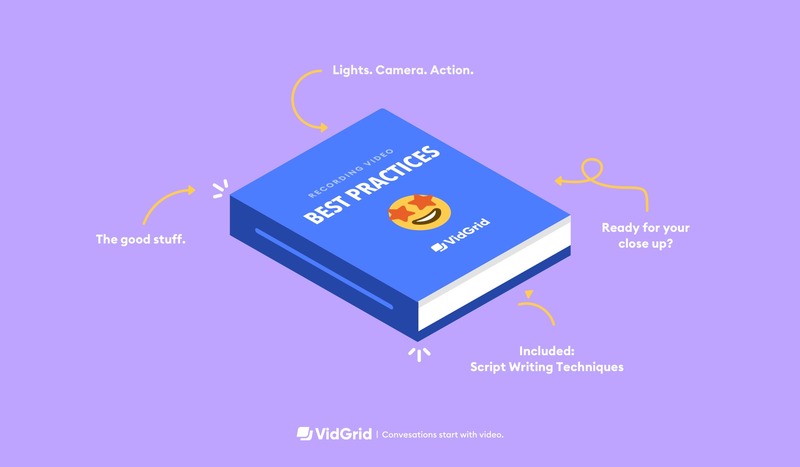 Until then, enjoy our Best Practices guide. Want to record your video in just one take? A few minutes of preparation will make recording a breeze. Next, choose if you are going to record yourself, your screen, or some combination. Record yourself to leverage the human relationship side of video selling. Record your screen to convey value through showing your product, your prospect’s website, a slideshow, or something else on screen. Your video should be less than 90 seconds. (The number of people who sit through a video greater than 90 seconds drops to just 37%). Tell your viewer why you are reaching out to them. Make it very clear your message is personalized to them. Show exactly how what you are are selling can help your viewer. Show your screen or product . Conclude by telling your viewer what to do next to move the process along. (Note: You don’t actually want to read from your script - you want to sound natural. However, it does help to write down everything you want to communicate in advance to ensure you don’t miss anything). Not every modern office comes set up with a recording studio. That’s okay. You can build your own! Just find a quiet space near a window in a clean part of your office, and you’re good to go. Make sure to test your sound. You might need to use a pair of headphones with a built-in-mic to improve the audio quality of your video. If you have an external camera (recommended: Logitech C920 or Razer Kiyo) use it. If you don’t, use your default computer webcam or phone camera. (Note, if you are using a phone, make sure to hold it horizontally. 89% of business related video views still take place on a desktop computer, where vertical videos look awkward). Always have light in front of you if possible (natural light is the best). Set your computer in front of a window. If you have a dark office, check out this selfie ring light. Set your camera looking slightly down at you to get the most flattering angle of your face. Center yourself in the camera, keep good posture so your body looks proportionate. Make sure the space behind you is clean and no one will be walking behind you. Wear jeweled tones - not white or black. A dark grey can be the best because it won’t wash you out AND will hide your mic. Proactively smile - practice smiling before you even hit record. Declutter your screen to reduce distractions. Make sure all of the content you want to show any is loaded and ready to go. Make sure there is no sensitive info on your screen (although if this is inevitable, you can always blur in post-production). Recording a video shouldn’t be much different than pitching a prospect face to face. But don’t fret if it takes you a couple takes to loosen up on camera. Look directly into the camera and act like you are speaking to a real person. Don’t hesitate to let your personality shine through. Speak slowly, pause between sentences, and lower your voice if you naturally have a high pitch voice. Vary your face, hands, and tone of voice naturally as you speak. Use hotkeys to start and stop the recorder instead of fumbling with the mouse. Don’t worry about a few ‘ums’ or ‘ahs.’ They tend to make the videos seem more real. You maybe have recorded using just your webcam in a makeshift studio, but you can still make your video look professional with simple editing. Trim the beginning and end of the video so the viewer doesn’t see you start or stop the recording (if you use your countdown and hotkeys effectively, you won’t have to do this). Blur out any sensitive material you may have captured that you don’t want to share. Add closed captioning for hearing impaired viewers or anyone who prefers to watch without sound. Throw in background music to set the mood. (We love to use this for micro-demos!). You have said your part. Now, how do you open the door to a conversation with your viewer? Invite the viewer to record a response back to you. Video does not replace traditional communication channels; it just makes them more effective. Share videos in your current sales cadences across email, LinkedIn Inmail, Twitter, etc. You don’t need to include a video at every step of your sales cadence. Scatter videos throughout at the beginning, middle, and end. Let your recipients know there is a video in the email by including the word “video” in your subject line. (To learn more about emailing out videos, see our next post Email + Video Dream Team). What percentage of viewers watch to completion? Where viewers drop off in the video. Are they all dropping off at the same point? What can you change there? How do viewers respond to questions? What percentage of viewers are completing the call-to-actions, scheduling meetings on your calendar or replying to your message? GridTip: When you see someone watches your video follow up asap! The best way to get good at making videos to to just get out there and start recording. What are you waiting for? Get started now with VidGrid’s 14-day free trial. Engage your audience with interactive video. Data data data, rocking everywhere. Every now and then we send an email with our best and latest content!